Rosin Eyecare is proud to be an Orland Park eye doctor and extend its eye care services to patients of all ages. With a comprehensive eye exam, your eye doctor in Orland Park is able to prescribe eyeglasses, contact lenses, and even recommend LASIK eye surgery. Our new optical store offers the latest designer frames and contact lenses to fit a variety of prescriptions, eye shapes and sizes. Each optometrist is very knowledgeable of the most common eye conditions and offers a personalized treatment plan to get you back to seeing clearly. For the past 80+ years, Rosin Eyecare has been a trusted member of the Chicago area community, helping treat and serve families with all of their eye care needs. 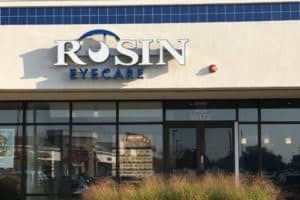 Committed to providing the best possible customer service, Rosin’s extraordinary team of optometrists and eye care specialists now take pride in extending that high level of treatment to Orland Park. Conveniently located in the heart of Orland Park’s shopping district, our vision center is open 6 days a week with flexible hours to accommodate a wide range of schedules. When you visit your Orland Park eye doctor for an eye exam, you’ll find that we offer a variety of eye tests to screen for vision correction, eye diseases like glaucoma or cataracts, color blindness, eye damage from harmful blue light, and more. Additionally, with an eye exam at Rosin Eyecare, we can determine if you have other eye conditions, such as dry eyes, astigmatism, presbyopia, or sarcoidosis. Our highly trained optometrists and ophthalmologists carefully review your eye exam results and family history to determine the best course of treatment. To learn more about other seasonal eye dangers, check out our Winter Eye Dangers blog. Call us today at (708) 590-7650 to schedule your next appointment, or stop by your Rosin Eyecare doctor located at 15172 South La Grange Road in Orland Park. *From the West: Take I-80 East to Exit 145 for US-45 (La Grange Road). Take La Grange Road north to Ravinia Plaza where we are located next to Kriser’s Natural Pet Store and European Wax Center. *From the East: Take W 159th Street west past Orland Towne Center and Orland Plaza Shopping Center to La Grange Road. Take La Grange Road north to Ravinia Plaza where we are located next to Kriser’s Natural Pet Store and European Wax Center.